Tree Survey is a type of Specific Purpose Survey to locate trees based on the client or local governing authority’s required diameter and/or type on a site prior to engineering or development. A Tree Survey will typically show the tree species, to the best ability of the surveyor’s knowledge, and the diameter (Diameter Breast High or DBH) of the tree. 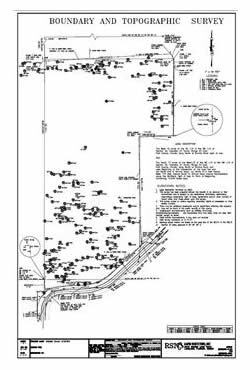 The surveyor then draws a map showing scaled location of trees in relationship to a boundary line or other on site physical features. If exact determination of tree type is required a biologist will have to mark species type on trees prior to or during survey. The main reason for performing a tree survey is to record the size and type of trees on a parcel of land that is to be developed. The engineer or designer will create their site plan determining which trees can remain and which trees must be removed. Prior to obtaining a tree removal permit for a major site plan or major site plan amendment, a tree survey might be required to be performed and filed with the local governing agencies as part of the tree removal permit application. They will make recommendations and sometimes request that the developer will replace trees in another location on the site. At Rapid Surveying we accurately provide the location and graphic depiction of trees size (Diameter Breast High or DBH) as defined by the client, engineer or local governing authority. Each tree is represented by a symbol that is unique to each species of tree as mapped, and shows the DBH of each tree.